iOS has certainly changed a lot since it was first introduced to the world in 2007 as iPhone OS. Back then, before the iTunes App Store existed, users were basically offered a few apps – SMS, the calendar, YouTube, a Web browser to name a few, but that was basically it. Still, in 2007 that was pretty advanced considering it was still one of the more polished operating systems next to Symbian, Windows Mobile, Palm OS and BlackBerry OS, especially thanks to its multitouch support. A new infographic from 7 Day Shop shows us how far Apple has come since 2007. Sure, some will argue that iOS hasn’t changed much but fundamentally it really has. iOS 7 introduced a brand new and flatter look that rid the operating system of skeuomorpism, and now iOS 8 will add in new notifications, open up the keyboard to third party options, open up the widget panel to developers and more. It will also work more seamlessly with OS X Yosemite and other iOS 8 devices, allowing users to answer phone calls and text messages on different Apple products. There’s even a Continuation feature for picking up work where you left off on one device. 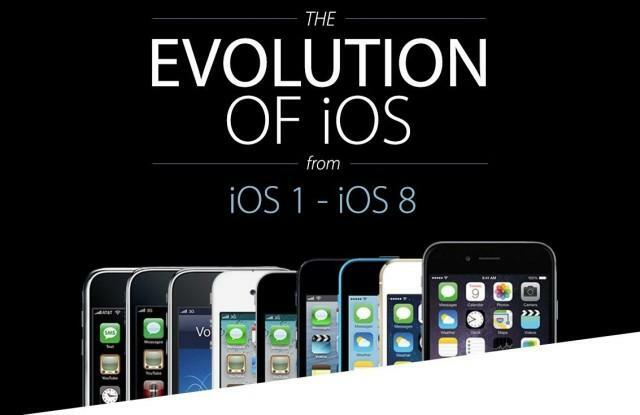 The infographic, titled The Evolution of iOS From iOS 1 – iOS 8, is embedded below. It shows how the icons have evolved, new features that were added to each iteration and more.